A paper in the February 2013 issue of the Journal of the American College of Surgeons describes 15 cases of median arcuate ligament syndrome treated with laparoscopic surgery. Median arcuate ligament syndrome (MALS) is somewhat controversial. It is said to be due to impingement of the median arcuate ligament (a portion of the diaphragmatic crura) on the celiac artery causing a narrowing and decreased perfusion of the stomach. Symptoms are abdominal pain after eating, nausea and weight loss. It is often diagnosed in patients who have been worked up for many other suspected problems without finding anything. The paper notes that 10% to 60% of people without symptoms have narrowing of the celiac artery. 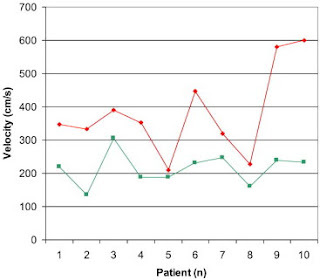 The abstract reports resolution of the pain for 14 of the 15 patients who had the surgery as well as a significant mean decrease in celiac velocity indicating resolution of the narrowed area postoperatively. It also mentions that one patient required conversion to open surgery but doesn't say why. On reading the whole paper, one learns that the conversion to open occurred in the only case that was done with robotic assistance. The authors state that the 2 mm injury to the aorta was the result of the robotic instrument being too large and "the absence of haptic feedback," which is robot-speak for "you can't feel anything." The aortic tear led to two liters of blood loss and an operative time of just under 8 hours. The abstract says all but one patient had complete resolution of pain, but the paper says the amount of decrease in the Doppler celiac velocity "did not correspond to the degree of symptom resolution." And you can see that the differences in preop (red) and postop (green) velocities are pretty modest in 7 of the 10 patients who had them measured even though the mean difference was significant at a p of 0.005. In addition, the postop values all hover around 200 cm/sec, which, in the presence of symptoms, was the threshold for doing the operation. In fairness, of the 13 patients who were interviewed, all said they were satisfied with the outcome of the surgery and would go through it again. In some ways, MALS reminds me of internal mammary artery ligation, which was once touted as a cure for angina pectoris (chest pain of cardiac origin). Over 50 years ago, randomized trials which included a sham operation—incisions were made, but the arteries were not ligated—showed that ligating the arteries was no better than the sham operation for relieving pain. It might be time for such a trial in MALS, only let's skip the robot for this one. Thanks to Dr. Michael Burchett for alerting me to the MALS paper. But Scalpel, it's so much easier to just read the abstract...time is money, you know. Can't they just write better abstracts? On a more serious note, it seems people are going to justify the presence of a robot no matter how many morbidities/mortalities that it takes. I waiting to see a robotic temporal artery biopsy any day now. "Can't they just write better abstracts? "....I wish more would. As a practicum RA my boss had/made me read dozens of research papers on early intervention, early developmental screening, etc. and there are some really bad writers out there who have been published! Not all good scientists are are writers and not all good writers are scientists. I have read quality, concise abstracts that say all that is pertinent but instil an interest in reading the full study. Some people are such techno-geeks that they have to use the latest gadget even if it isn't the best way to get the job done. Libby, of course they could, and should, write better abstracts. But the journal editors let authors get away with misleading or incomplete abstracts all the time. My comment about better abstracts was somewhat tongue in cheek, but I see that I may have been on to something. The blind squirrel may have found an acorn. But who is going to mandate writing better abstracts? I doubt that anyone will. If you chase down the trial of a sham operation in the internal mammary ligation paper, you'll find it was not randomised. The authors simply performed a sham procedure on a handful of subjects - and all reported clinical improvement in their anginal symptoms. Thanks for pointing that out. I could not get a full text copy of that paper. I am a patient who suffers from MALS and underwent the laparoscopic release of the ligament.. Almost 2 years later I am suffering from the same symptoms, even worse than before my surgery. I'm wondering if other organs that are dependent on the celiac artery for supply, got partially damaged due to lack of blood flow... Maybe, I"m not sure. Not a doctor, just a sick person trying to find an answer. It's pretty tiring not being able to eat without nausea or vomiting. A person can only lose so much weight and be so malnourished before there's nothing left of them..
Dear Brittney, I am sorry to hear about your unsuccessful surgery. Yours is a complex problem that I am not an expert in. I do know that blood tests would reveal if your liver is damaged. There is collateral circulation to most of the abdominal organs so even if the celiac artery was damaged, the other organs should be able to function. I hope you are seeing a competent doctor. Your problem should be investigated thoroughly.